Click here to view a pdf on code requirements for fire rated framing. Because fire rated glazing is used in door, window and wall assemblies, code requirements for framing must also be considered.Â Simply put, the fire rated framing requirements must match the glazing requirements in order for the assembly to fully meet the requirements of the code. Fire protective framing is allowed where codes allow fire protective glazing.Â When codes require fire resistive glazing to block radiant heat transmission, fire resistive framing must be used, and the entire assembly must meet the same rating requirement as the wall. 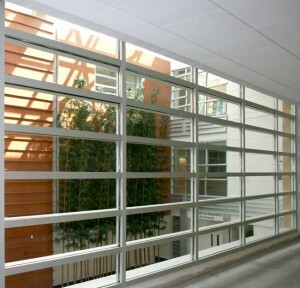 For example, project specifications that configure fire resistive glazing in hollow metal frames in 1- or 2-hour exit enclosure applications fail to meet code, because fire resistive glazing with fire protective framing lowers the overall fire performance rating of the assembly to fire protective.Â In 1- or 2-hour applications where meeting ASTM E-119/NFPA 251/UL 263 is required, both the glazing and the framing must be fire resistive. The most common frame is hollow metal, such as SAFTIfire HM. 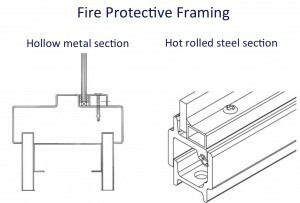 Hollow metal frames are fire protective, not fire resistive, and they fail to block the spread of radiant heat.Â Â Fire protective framing, like fire protective glazing, has limited use in applications rated over 45 minutes.Â This type of framing can be used in doors, sidelites, transoms and interior windows up to 45 minutes. 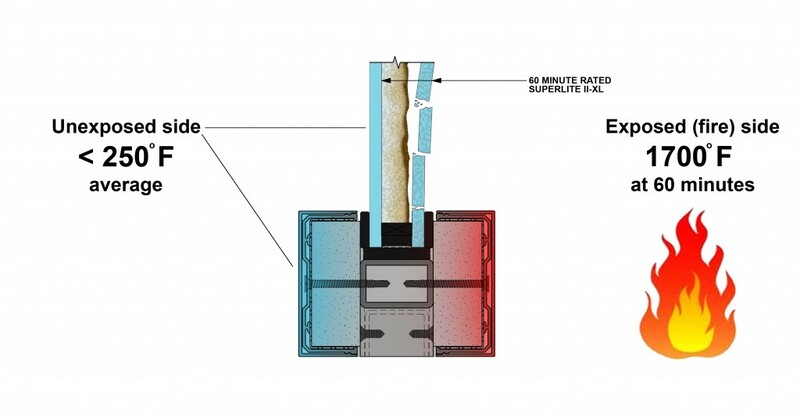 When the code requires fire resistive glazing, it must be part of an equally rated framing system.Â Fire resistive framing, such as SAFTIfire GPX, has the ability to block the spread of radiant heat.Â Like fire resistive glazing, this type of framing meets ASTM E-119/NFPA 251/UL 263 requirements.Â Fire resistive framing can be used in wall and door assemblies (this includes glazing around and over the door, such as sidelites and transoms) rated 60 minutes and above. Products used:Â Fire resistive SuperLite II-XL 120 in fire resistive SAFTIfire GPX framing.